I’ve used mind mapping (pen & paper, and also software) in both work and study, and found it to be a very valuable tool. a review of the book “The Smartest Kids In The World: And How They Got That Way’ by Amanda Ripley. An idea which needs to considered all over? Agree? Disagree? ‘In 1843 Charles Dickens wrote A Christmas Carol which speaks to an identical issue we face today. This is a ‘must read article’ by US psychologist Peter Gray. An Illustrated History of a Special G.E.R.M. New chum Prime Minister, Kevin Rudd, while taking control of everything on 3 December, 2007 dreamed up a ploy to demonstrate his toughness. Influenced by the brain-dead scato-meme called GERM, he decided that he was going to smarten up school performance, using GERM’s raison d’etre. He called it a Revolution. He knew a soft target when he saw one. 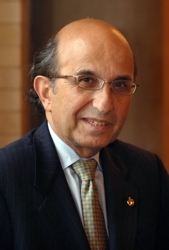 His close colleague, devoted Deputy and Minister for Education Julia RM Gillard, liked the idea of being a termagant presiding over the activities of timid educators; so, ignoring kids mental, emotional and cognitive welfare, she made unilateral arrangements for the introduction of something that no Australian child-oriented educator would ever have contemplated. Where did she get the idea? On 27 June, 2008 while attending a Carnegie Corporation knees-up in New York, she met sweet-talking co-lawyer Joel Klein, as schadenfreude as she, who ran a kitsch system of schooling in the Big Apple that relied on conformity to political and corporate dictates. She had found a soul-brother. As leader [lawyer?] of a school district, he persuaded her [lawyer!] to adopt his ‘crime and punishment’ style of educational management. Keep the work force cowed and fearful of losing their jobs. Scare the daylights out of children by forcing them to do standardised tests of selected fundamentals. It’s guaranteed to work; money-wise. Don’t allow educators to share the idea….only measurers and corporate benefactors; and, later, don’t let journos talk about it. They can be pesky. The giant banking corporation Swiss Bank aka UBS paid for Mr. & Mrs. Klein to visit Sydney, Melbourne and Canberra. At the Canberra Press Club, the Canberra Times writer, Emma Macdonald exposed him as a fraud but it didn’t matter. Who dares challenge the big end of town? Who cared about kids at the time? During the visit of Joel Klein to Sydney, he outlined his policy of fear and was applauded. Julia RM Gillard immediately set about arranging the compliance of locked-in sycophantic claques, who, Klein had warned her, were likely to oppose her on professional grounds. She knew that they would comply easy. They did. First targets, according to the Klein/Gillard m.o., were parents and teachers, usually the two essential partners in successful schooling. They had to be dis-empowered and their rights hidden from public views. No problem. All teacher groups did as they were bid, despite the growing evidence that it was a really stupid idea. Meanwhile, back in H.Q. Big Apple, Joel Klein took charge of Rupert Murdoch’s $US700billion testing company, Amplify, on a $2m p.a. salary and in-flowed the money. The notion of making big, big money from kids’ classroom tears and fear was phenomenological. First time in history. It is usually ‘Kids First’. Aussie-based NAPLAN still relies on fear-driven premises; very few folk care and the cash registers toll louder and louder. Yank-happy Aussie testucators have been faithful to all edicts even though the methods were mean, miserable and vomitous for children. While anxious educators protested [ http://www.literacyeducators.com.au/index.php/naplan ], eichmannised testucators with doubtful ethics, some in charge of schools and school systems, kept fracking children’s cognitive development and learning happiness to try for better test scores on teeny-weeny bits of a wide, future -focussed curriculum…. and on nothing else! Out went the baby. 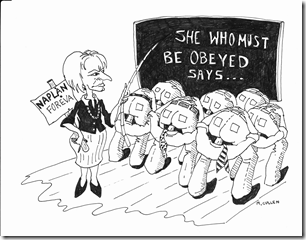 Surprisingly, the Klein system still remains in place and, even though NOW – election time – is the best time to ban the blunder, nobody is game to say anything about NAPLAN nor to try too hard to get rid of it. It’s all part of the original dastardly scheme. 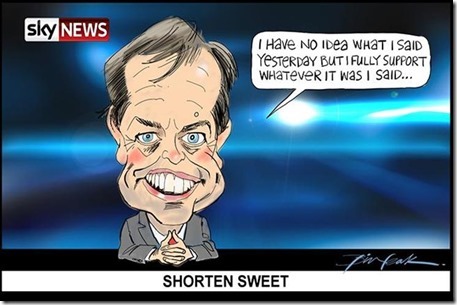 Things are now going well from Julia RM Gillard’s point of view. She believes that Australia will raise its score to the top 5 in the peculiar, unsatisfactory, meaningless PISA tests by 2025. Top 5 in schooling immaturity, wethinks. [ http://www.tes.co.uk/article.aspx?storycode=6344672&navcode=0 ] That aim is now part of Labor’s declared policy! Even the political opposition has embraced it. 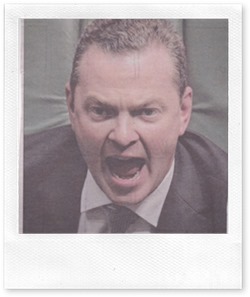 Opposed to child-centred education as fervid devotees of the Gradgrind School of Pedagogy, their Minister of Education, Mr Chris RM Pyne is looking forward to installing a robust curriculum into all schools. Poor kids. Just what you need. Meanwhile the money rolls in…to RM, USA. He looks at the palm of his hand every now and then…..and pats them on their tiny little heads. The years since 2008 have been messy and dysfunctional. Australia’s school education has been heading in the wrong direction. We all know that it is. The silent press doesn’t care. WATCH OUT KIDS. BE AFRAID. THE FUTURE ??? NOT GOOD !!! OH. WHAT A MESS WE’VE MADE……. Nah, let’s have top down standardised education to prepare children to participate in the workforce. Why are we teaching like it’s 1992? While this article is about the USA, it’s very relevant to any GERM infected country. Common core in the USA is like national standards in New Zealand, although possibly worse, given the reliance on standardised testing. This infographic looks at the relationship between common core and college preparedness. I agree – once the teacher and children become aware they are being observed, the classroom is no longer functioning as it usually would. The validity of any conclusions is suspect. The current emphasis on accountability, performance pay, etc, just makes it worse. The ultimate abomination is Bill Gates’ proposal of video cameras in all classrooms, recording every event of every day. This article is about the USA; however there’s much of relevance to teachers all over. Excellent RSA Animate style video from the Post Primary Teachers Association about the effects of ‘reform’ and restructuring on New Zealand education. Australian/US educator Pat Buoncristiani writing on the difference between reading books and reading online. Some years back, I tried, without success, to make similar points to a Massey University reading ‘expert’ but my observations were dismissed. Remember this? C’mon, be honest…. That phrase has irritated me for years, and is an example that illustrates how we should be very mindful not to use jargon that originates outside education. The forgotten concept of ‘public good’ needs to be reintroduced into our dialogue. It’s election time. no special guest. Q&A [ABC] does not approve of the mention of NAPLAN on its show. 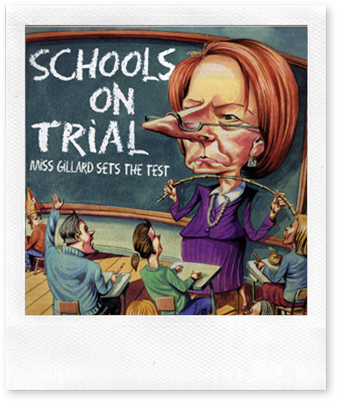 Here is a Q&A, devoted to NAPLAN, that was run on ‘Primary Schooling’ in April 2010 – – when Julia was the Education Minister, the manufactured consent of local unions and ‘professional’ bodies had been arranged, testucators were goose-stepping behind Her Immenseness, the press was losing its respect for kids, dominant corporations were overjoyed; and coercion needed no justification. Q. Is Australia really failing to reach reasonable standards of schooling? A. Yes, it is; and things will get worse if we continue to follow the imported practices for much longer. A. It keeps copying the quick-fix, force-feed, packaged culture of its dominant friends , the US. and the U.K. It used to copy the best aspects of schooling from parts of these decentralised systems when they were run by schoolies. Then shallow, profit-based business took over with politically-backed manic energy – both up-over and down-under. Since the time of Governor Phillips, Australians have always felt inadequate when it comes to heavy-lifting intellectual work, never believing that it can produce an indigenous Aussie system of real learning and achievement. Hence our penchant for copy-catting. The root problem is that, in all three places, there is a prevailing business credo that someone with a Ph.D in anything knows everything; and can run anything. This forte of business modellers took over political thinking in the late 1980s. New York/Harvard managerialists provided the classic model of these beliefs and established a system of schooling that was heinous. We copied it, without thought or belief in ourselves. Q. Well, what should Australia do to get kids to learn more and better. A. It’s a pity that we cannot turn the clock back to 1990. That was the defining year when management theorists and business modellers tossed the baby out, when all they had to do was change the nappy. For instance, those who supervised the standards of all school activities were made redundant in that year. We called them Inspectors. Instead of continuing to place such people with wide hard-yard experience, proven academic ability, a measure of authoritative clout, and a yen to ‘fly with pollen on their wings’ to positions that mattered, we adopted the Patel system of appointment to positions of higher authority. A practical background did not count. If a candidate could compile or purchase an attractive curriculum vitae, use better-than-average thespian skills at interview time, and had an academic background of any sort, the job was theirs. So. Plumbers took over the garage. Is it any wonder that the answer to your first question is ‘Yes.’ ? But, in answer to your implied question asking if Australia can develop an administrative model that makes us the very best in the world, the answer is a big YES. 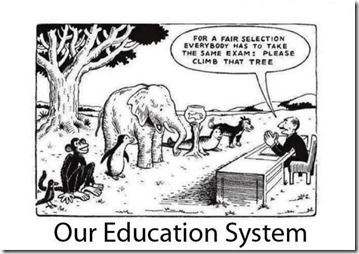 THE THINKING needs to start from the classroom, the business end of any schooling system. That’s where a country’s future is located. That’s where our teachers and pupils get together. That’s where the action is. What happens there determines what sort of country Australia becomes. Think about it….seriously. It hasn’t been tried south of Finland yet; but Australia has the knowledge and expertise NOW within its school-active working ranks to design and operate an holistic model that focuses on achievement in ALL the things that our down-under society believes to be important. Trust me. Q.That’s all airy-fairy wishful thinking, isn’t it? A. On the contrary. In each room that is a group of pupils [‘student’ – a meaningless word in a school context] who interact with an adult to develop a learning expertise that is unique to them and will last them forever. That’s what ‘pupilling’ means. Teachers are trained to do ‘it’ better than others. They know about learnacy, the centre-piece of classroom cognitive development. A school’s first duty is to pupil children. Each day, the interaction between both pupil and teacher is intense, as it should be; and needs to be well planned and well resourced. Before you ask……yes…..fundamental learnings are crucial. Some learnings are quasi-measureable and parts of these lernings are generally regarded as essential.They have a special need to be pupilled very carefully if we require our future citizens to want to do the best they can do in whatever they choose to do. We certainly should not frighten vulnerable young children with fear of failure nor scare them away from learning things. Effective learning is such a pleasant, delicate matter. 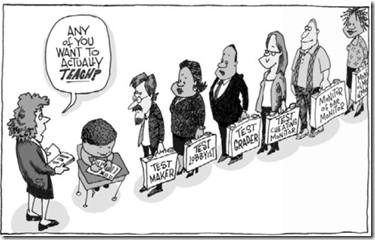 A reliance on testing procedures is a heavy, jack-booted, lugubrious, prosaic state of affairs. It’s the work of the devil. At the same time, children want to feel that things are going okay. They evaluate their progress as they go and they usually like to share their successes with someone close, whom they respect…Mum, Dad, Teacher, Friend, Relative…as long as their co-evaluators respect the level of confidence that their learning progress means to them. Evaluation is an essential part of learning. It is on the spot, positive, personal, private, developmental. It recognises the place of errors as an essential part of learning. The fear-based forms of so-called accountable blanket testing regimes, conducted from afar, are particularly destructive of the learning processes. They destroy every known tenet of top-level learning. Please note: State based efforts to standardise learning outcomes destroys the uniqueness of each child. As such, t is cruel and immoral. Each child has an idiosyncratic learning style, and the teacher has to handle each style. Each teacher uses an enormous range of strategies for particular situations that are arranged or happen to occur during each day, ranging from the didactic [bossy chalk-talk] to the maieutic [chid-initiated]. A myriad of group-learning techniques form part of each teacher’s repertoire, which themselves are personal and idiosyncratic. Teaching is a busy, busy high-octane occupation. Tolerating criticism from sciolist managers and ‘know-it-all’ rigor-based, child-despoiling politicians on accountability kicks, is part of the game. Teachers have to accept that “…where ignorance is bliss….’”. Let me refer you to the work of our own Aussie, Dr. Michael J. Dunkin, whose studies of classroom practices is esteemed world-wide. He draws serious attention to the sorts of things that happen at school, more often ignored as quirky than regarded as of any consequence. When you hear our Shortens, Pynes, Gillards, Garretts, McGaws, Nelsons, Randells, Piccollis and the like discuss classroom activities, with the dignified expertise that Dunkin does, you will know that they have started to think about children’s learning and that Australian education is in safe hands. We await. When they can only discuss assessment of children’s testing abilities, and use weirdo descriptions like ‘5 by 25s’ or ‘we need a rigorous curriculum’ or ‘let’s get rid of child-centred education’, be worried. Be very, very worried. Why not design a schooling system that starts with a discussion on these sorts of things…and NOT from the presumptions of those whose only classroom experience comes from the crash-bang-wallop, gotta-pass-the-exams techniques of their own school experience. The anti-child finds easy managerial comfort in controlling systems that still believe in Edwardian techniques that David Copperfield and Tom Jones endured, head-mastered by the likes of Creakle and Gradgrind : “What I want is, Facts. Fact, fact, fact!” Australia introduced the modern-American version of this approach and we called it NAPLAN. It’s so easy for test nerds to follow. But. It’s was vomitous then. It’s vomitous now. Q. Are you saying that you would have no external testing of any kind? A. None whatsoever. The use of state or country-wide blanket testing in Australia, United States and Britain has shown itself, empirically. to be very damaging to functional learning, children’s mental health and parents’ expectations. We continue with it only because large corporations have a stake in the profits from test-paper publishing, on-line programs, sale of androids and learning-based apps; and from growth industries such as specialised coaching clinics, personalised coaching, sale of pharmaceutical supplements and special packaged programs of all kinds. [That, dear reader, is a brief description of the Australian schooling system as it is…now. ] NAPLAN is, put simply, a multi-billion-dollar industry . It does not…..does not…..does not contribute to improved classroom learning of any kind. Q If tests are so damaging, how come the principals of schools haven’t told us so? A. Australian principals of all kinds are wonderful people, so easy to get along with, so knowledgeable and keen……and so easy to control, politically. They are busy at school as curriculum leaders and as head teachers. That’s their job….curriculum leadership….guiding pupils through the best learning experiences and leading teachers through the best pupilling techniques. The more they are immersed in the teaching-learning activities, the better the school. In these turbulent times, they have to read widely and deeply. They have to give parents their personal opinion about the school’s place in the changing landscape. They need to be able to give their opinions of the more popular contemporary education literature – The Cambridge Review, Death and Life of the Great US School System, The Stupid Country. Their tasks are onerous….far more onerous than other academic or intellectual pursuits. Australia is fortunate to have the kind of school leadership that it has. However, when asked why they don’t speak to their parents about the parental rights and privileges as applied to NAPLAN or to comment on the usefulness of SBTs like NAPLAN they will tell you they are not allowed. This kind of ‘fascist shift’, as Naomi Jacobs describes the present changes in the political landscape from democratic governance to uneasy forms of ‘benevolent’ dictatorship, prevents schools from progressing much further than the present level of mediocrity. As parents, our rights are being denied and our principals have to do the dirty work of test-crazed politicians and greedy entrepreneurs by curbing their ethical beliefs and just doing what they are told. Collectively, they have the power to refuse to administer NAPLAN tests on ethical grounds and their part in breaching the U.N. Rights of the Child Charter. Apart from the implications of such immoralities, what true educator can possibly approve of a fear-based schooling system? Well…..Since national needs are framed by the needs of the dominant, Rupert and his testucators are having their way. That’s it! What’s with the ethics and moraities, anyhow? 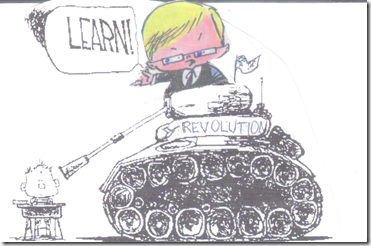 Q, Won’t GONSKI and the new reform movement help? A. Yes. They are the most promising vehicles of progress in decades. Australia could move along well once the mechanics fix or replace the defective parts. Sorting money and organising Rupert like curriculum programs for onlining to schools will take some time, however. AND….. It wont go very far while one of its tyres is flat and it tries to drag heavy, chartered useless gimmickry. RESCUE THE KIDS AND OUR FUTURE. BE BRAVE. BE DARING. THINK OF THE KIDS. Did you cruise around ‫Images of Treehorn ? Do Green Classrooms Lead to Artistic Teaching? This is a superb antidote to GERM. This has been used for over half a century, in spite of some very valid criticisms made by many educational experts. The present emphasis on standardised learning, sequential achievement objectives, etc, is a descendant of Bloom. While Bloom has been adapted to guide thinking and questioning processes, this wasn’t his original intention. This is the real job facing teachers – creating a sense of awe, or as another has put it, creating learning experiences of children that enable ‘mini-love affairs’ with something they have learned. You’ll all know the story – a child whose learning experiences develops into a life long passion and career. All in all, a long way from any notion of standardised learning. What Are the Risks in Using Data to Predict Student Outcome? David Warlick is yet another ‘must follow’ educator. A much needed critique of John Hattie. Staying with the ‘Hattie’ theme, here’s another critique. Convinced yet? Bruce Hammonds is an indefatigable reader of educational articles. Here’s a couple of links from Bruce. This article includes a very comprehensive table. NAPLAN is a dirty scheme. Isn’t it ironic? Rupert Murdoch who has made millions and millions of dollars from NAPLAN testing over the last five years, has sent his No.1 hit-man to organise News Ltd., other media outlets and his lobbyists to organise the defeat of the Labor Party in Australia. Makes one wonder, right? This was the title of a talk to over 100 attendees at a U3A gathering at Cleveland, Queensland on Monday 5 August 2013. It seemed to be the popular opinion of the majority of the audience. I tried to indicate that, if I was still the State Director of Primary Education, this statement would probably be headlined in the local press on the next day. 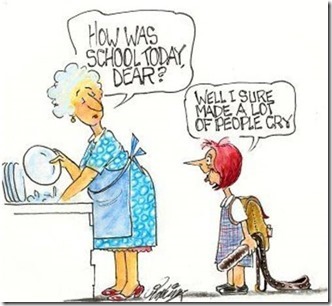 It wont be, because, these days, negative comments on NAPLAN of any kind are forbidden through the media. Rupert Murdoch and allied measurement-freaks wont allow them to do so. NAPLAN is not to be discussed. It is deliberately embargoed by school authorities by fiat. The Darwin Effect is working well, but not for any worthy reason. Also. I mentioned that NAPLAN’s link with Gonski [Money] and the ‘new order’ schooling [Politics] is tenuous. Both have worthy intentions, but can hardly work while NAPLAN dominates the testucating landscape, and controls how things are taught. 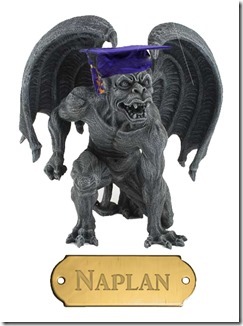 You know that NAPLAN never ever had any worthy intentions. It’s a really dirty business totally controlled by Rupert and associates. Another point was that the issue will not the discussed in any other forum. We adults just don’t care what happens to children at school. 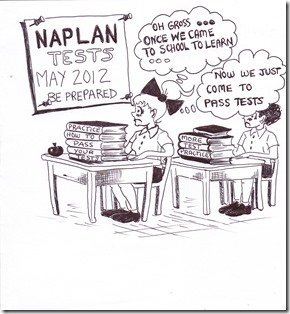 We all know that NAPLAN testing induces fear of schooling, loss of sleep, pre-test vomiting and plenty of tears. The immorality of enforcing such fear based tensions into the teaching act will continue to be ignored. They’re just kids. Why worry? Children are turned off learning. Shows no regard for other parts of the curriculum. Induces fear and stress on children as young as 7 years. Tests scores seldom improve by any noticeable level. Endorses cheating at all levels of schooling, especially administration. Provides millions of dollars for greedy entrepreneurs. Failures rather than successes are remembered. Three days sweating over statistically invalid tests. It initiates a dumb, dumb, dumber kind of schooling. 83 Read it? Did you note the piece on Press Control?